Musician Dan Smyers from the musical duo Dan + Shay wore a Vacheron Constantin Overseas the reverse panda dial chronograph at the 54th American Country Music Awards last night. Dan + Shay were the night's biggest winners winning three awards, including Song of the Year and Single of the Year for their 2018 "Tequila." Dan Smyers and Shay Mooney also scored their first-ever Duo of the Year win. 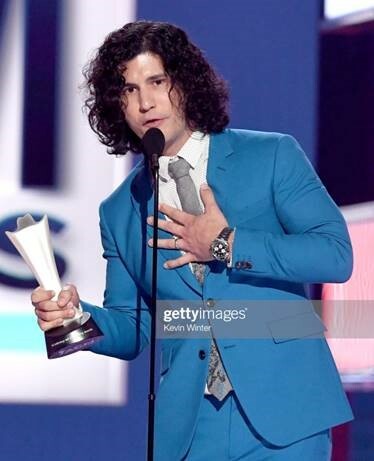 Dan Smyers of Dan + Shay accepts the Song of the Year award for 'Tequila' onstage during the 54th Academy Of Country Music Awards at MGM Grand Garden Arena on April 07, 2019 in Las Vegas, Nevada wearing the Vacheron Constantin Overseas Chronograph.